Aloha, Astoria, Banks, Beaverton, Boring, Camas, Canby, Clackamas, Cedar Hills, Cedar Mills, Damascus, Dundee, Estacada, Eugene, Gresham, Happy Valley, Hillsboro, Keizer, Lake Oswego, Milwaukie, Molalla, Newberg, North Plains, Oatfield, Oregon City, Portland, Ridgefield, Rock Creek, Salem, Sandy, Sherwood, Springfield, Sunnyside, Tigard, Troutdale, Tualatin, Vancouver, Washougal, West Linn, West Union, Wilsonville, Portland Oregon and Woodburn. Have you ever thought that you would love to have a pony come to your home and surprise your child on their birthday? You have come to the right place for Pony Rides. Wish Upon a Pony will bring one pony, or more, right to your house! Imagine the delight on your little ones face when a pony arrives as a special guest. If your having a large party of more then 12-15 children, you might want to consider having two ponies come to your event. You can share the ponies, or if your child wants to ride the whole time, the second pony can be there for their friends to share and enjoy. If you are planning a larger event like a company picnic, church event, school carnival, block party, fund raiser, street fair, BBQ, 4th of July Blowout or any event that might enjoy having ponies come to your location, then please contact Wish Upon a Pony and discuss your needs. We make it easy to arrange pony rides for your event. We service the Portland Metro area and beyond. Call us at 503-866-6702. We need an area of about 20X20 to set up our pony ring (pony carousel) and even less for a hand lead pony. Don't worry about the weather, rain or shine, Wish Upon A Pony will be there. We have a cover for the ponies if it is needed. You will find that we are very accommodating, love children, and try very hard to help make your pony riding event a success. If you have any questions or concerns, please call us at 503-866-6702 or e-mail and we will get right back to you. If you are looking for a pony to visit your event, please consider Wish Upon a Pony. We are a family run business and we take pride in our ponies. 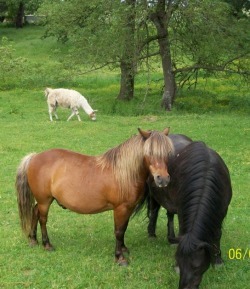 Our ponies, like family to us, are treated humanely and it shows. Check us out and see if you agree. * Travel charges may apply to certain areas, please inquire. * Ask about our cancellation policy.